You think you have it all figured out. It’s genius. What is one of your favorite things to do in your spare time? Play a game, watch a trailer for a game, read about a game. You wish you could spend all your time with games. But LIFE says you have to make money otherwise you can’t play your games anymore! But wait, what if there was a way to be with games all the time…AND make some sweet, sweet loot, too! Then it dawns on you. GAME DESIGN. This economy! What a mess).” You narrow it down to the perfect three schools, even though you’re only 17 and have a number of months before you even have to think about deadlines. And then the pit hits. It surfaces in your belly like a bubble of swamp gas belching up from the depths of a peat bog. What if you spend all your time designing games, only to find that your new job has ruined your (ex) favorite past time…. dun Dun DUUUHHHNNN! No more swamp gas! Let’s get to the bottom of this. Or “take the red(dit) pill,” whichever movie reference tickles you more is fine by us. 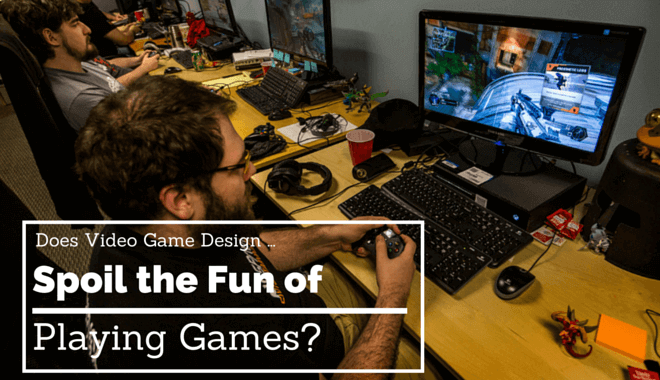 Would designing video games actually ruin your gaming fun? We turned to one particular Reddit thread, full of everyday gamers-turned-game developers (future you’s!). This exact question was posed by a bright-eyed youth facing similar bouts of trepidation and uncertainty. The overwhelming response? Yes! It ruined gaming for a lot of players! But not in the way that you think. See, video game design can be a very time-consuming profession. When the team is in “crunch time,” you will be putting in some pretty late nights. Or, if you’re working long hours on a small-team indie project, you’ll feel a lot of pressure and just want to work on the game. It’s that pressure, and those long work hours, that ruined gaming for them. They didn’t have any time left to play! Some poor soul had cut his play time down to 15-30 minute sessions. Madness!!! Others said they felt too guilty playing a game at all, when they knew they should be working on developing their own game. And committing 90 minutes to watch a movie was universally deemed completely out of the question by these over-worked game devs. What About People Not on Reddit? Fair question. One very reasonable gentleman responded to this question, posed by a different youth, on a different site. His answer was very different, and a good bit more encouraging, too. He said that he noticed the design more. He noticed bad design. He noticed good design. And he said that he was thankful for it. It made him more forgiving of bad design, because he now knew how challenging it could be. He was also able to better appreciate good design. Good design actually got him excited in games. And he could appreciate what indie developers were doing, seeing their conventions-to-the-wind approaches with a newfound respect. A good lesson for you and those overworked boys is this: find the right mix! You have someone who appreciates the new lens through which he sees games. It’s made him both more sympathetic towards bad game design and more appreciative of good game design. Those redditors feel such a strong pull towards developing their own games that they can’t make time for themselves to relax and play someone else’s game. Find the right mix of work and play. And find the right mix of noticing design, whether good or bad, and getting lost in a world that isn’t our own. After all, whether it’s real or virtual, life is what you make it!